In the absence of a better alternative, many of us turn to old toothbrushes for help with the tedious task of grout cleaning. Jim Hill, the creator of the Grout Gator, was no exception. While the soft bristles of his toothbrush were ideally suited for the size and shape of his mouth, Jim thought there had to be a better way to remove the grimy build up that settles into grout lines. 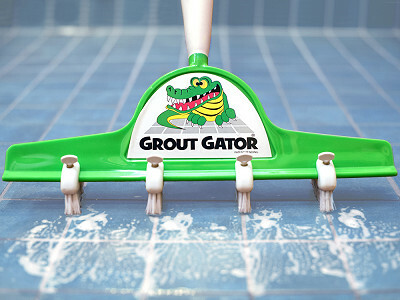 The Grout Gator enables you to clean between multiple tiles at one time, providing at least four times the brushing power of an ordinary toothbrush thanks to four, adjustable brush heads featuring stiff, sturdy bristles strong enough for industrial use and household jobs alike. Designed to accommodate tile sizes from 2 to 12 inches, the Grout Gator's brush heads are easy to adjust and its soft-grip handle is angled for optimal results. 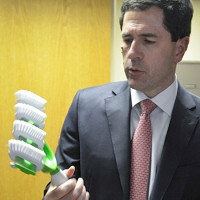 For hard to reach areas, this innovative cleaning tool can even be attached to any standard sized household cleaning pole. At my house, I'm the one who cleans the grout. That includes the bathroom, the hallway, the shower, the tub... Needless to say I was very eager to find a superior way to clean grout quickly - one line at a time just wasn't going to do it. 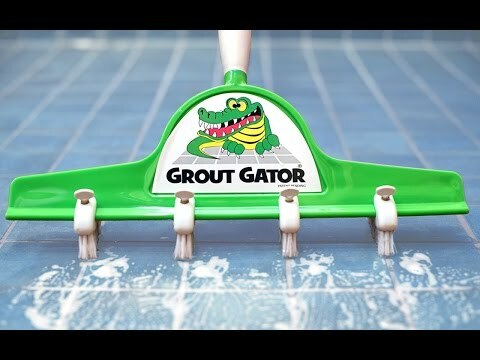 That's how the idea for the Grout Gator first took root, and judging by the overwhelmingly positive response, I wasn't the only one looking for a better solution. Please feel free to ask any questions that come to mind, and thanks for having me! I love this product! With 2 floors of slate, it makes a huge chore fast and easy. Be sure to get the extension pole to save on your knees! We're excited that you like it, Patrice. I too am excited to try it out in my bathroom. @Amy My neighbor was so impressed by my freshly cleaned floors that she borrowed it and hasn't yet returned it! :-) She promises it will be here over weekend as I have incoming company and want to tackle the marble tile in the guest bathroom. It really does work. @Susan HI Susan, good to know that you're interested in that size. The Grommet team will be in touch should it become available on their site. Is there a video that would show how this works in tight places...like the corners of the shower? We took a video here at The Grommet that should help show it in action. You can see it here. Jim, I really wish you could have made this product in AMERICA. I like the idea, but I am going to wait and maybe someone will make something like this in the USA. Which cleaning solution do you recommend for the Gator? Many people recommend using a generic household cleaner like Mr. Clean or Lysol. The more green alternative like baking soda or vinegar have also been known to work well. A simple google search might help you get some valuable opinions too. In the absence of a better alternative, many of us turn to old toothbrushes for help with the tedious task of grout cleaning. Jim Hill, the creator of the Grout Gator, was no exception. While the soft bristles of his toothbrush were ideally suited for the size and shape of his mouth, Jim thought there had to be a better way to remove the grimy build up that settles into grout lines. 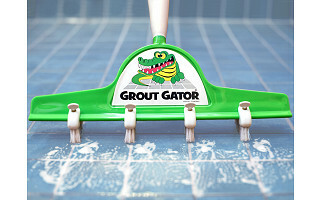 The Grout Gator enables you to clean between multiple tiles at one time, providing at least four times the brushing power of an ordinary toothbrush thanks to four, adjustable brush heads featuring stiff, sturdy bristles strong enough for industrial use and household jobs alike.